September 16, 2016 – Engineers are preparing for tests to qualify the propulsion subsystem, including the main engine, for Orion’s European-built service module that will propel the spacecraft during different phases of flight in deep space. They will test engineering units of the spacecraft elements that will fly on Orion’s first test flight with NASA’s Space Launch System (SLS) rocket in late 2018. NASA is scheduled to test a propulsion qualification module including flight-like test units of the engine, propellant systems, and propulsion control units at the agency’s White Sands Test Facility (WSTF) in Las Cruces, New Mexico beginning in spring 2017. The 13-ton service module provided by ESA (European Space Agency) will provide propulsion, power, temperature control and air and water for future crew members aboard Orion. But before the main engine is incorporated into the service module, WSTF will play an essential role in ensuring it meets the requirements for flight. The service module main engine is a modified Orbital Maneuvering System (OMS) engine initially used on the space shuttle to provide thrust to enter and exit orbit, rendezvous, and abort situations. 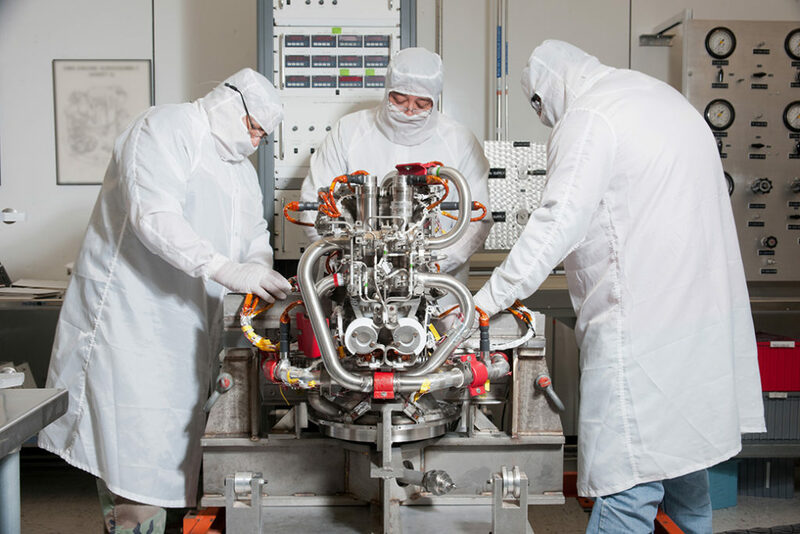 NASA is repurposing the OMS engines for use in the European service module. WSTF retained 11 of shuttle’s OMS engines and components from the thrust vector control system, allowing NASA to retain proven heritage hardware. Bob Cort, Manager of WSTF, said NASA is in the process of repurposing Test Stand 301 to conduct rocket engine testing. The stand was originally built in the 1960s to test the service module propulsion system for the Apollo Program. The Propulsion qualification module that will be used for testing is currently being assembled by ESA contractor, Airbus Defence and Space. It is scheduled for delivery to WSTF later this year. It consists of several helium tanks, propellant tanks, thrusters and flight-representative equipment such as piping, electronics, pressure control assemblies, a pressure regulation unit and propellant isolation equipment. Data from the testing at WSTF will support verification of the proper operation of the service module propulsion system. While the main engine and test facilities at WSTF are prepared for the spring hot-fire, the main engine for flight has been refurbished and acceptance tested at WSTF, and was shipped to NASA’s Johnson Space Center in Houston for vibration testing. The vibration testing is helping to ensure the engine can withstand the loads induced by launch on the SLS rocket. Following testing at Johnson, the flight engine will be supplied to ESA to integrate into the Orion European service module for flight. Through an international collaboration, NASA is working with ESA and its contractors to provide the service module for Orion’s first joint mission with SLS, known as Exploration Mission-1 (EM-1). The first test flight in 2018 will send an uncrewed Orion about 40,000 miles beyond the moon.